I’ve been looking for a good analogy of what programming in C++ feels like and I remembered this 1990 Tim Burton movie, Edward Scissorhands. Having scissors for hands in not all that bad. Edward has many talents: he can, for instance, create stunning dog hairdos. I often have these kinds of thoughts after attending C++ conferences: this time it was Going Native 2013. The previous year, the excitement was all about the shiny new C++11 Standard. This year it was more of a reality check. Don’t get me wrong — there were many stunning dog hairdos on display (I mean C++ code that was elegant and simple) but the bulk of the conference was about how to avoid mutilation and how to deliver first aid in case of accidental amputation. The C++ lore is that you should avoid naked pointers, avoid arrays, avoid delete. So the remedy for the lameness of malloc is operator new, which is also broken because it returns a dangerous pointer and pointers are bad. We all know (and have scars on our faces to prove it) that you should use the Standard Library containers and smart pointers whenever possible. Oh, and use value semantics for passing things around. No wait! Value semantics comes with a performance penalty because of excessive copying. So what about shared_ptr and vectors of shared_ptr? But that adds the overhead of reference counting! No, here’s a new idea: move semantics and rvalue references. Of course, you might recognize all these pro-concurrency and parallelism features as functional programming — immutability and pure functions in particular. At the risk of sounding repetitive: Haskell is way ahead of the curve with respect to parallelism, including GPU programming. That was the reason I so easily converted to Haskell after years of evangelizing good programming practices in C++. Every programmer who’s serious about concurrency and parallelism should learn enough Haskell to understand how it deals with it. There is an excellent book by Simon Marlow, Parallel and Concurrent Programming in Haskell. After you read it, you will either start using functional techniques in your C++ programming, or realize what an impedance mismatch there is between parallel programming and an imperative language, and you will switch to Haskell. Yoda Conditions: Using if(constant == variable) instead of if(variable == constant), like if(4 == foo). Because it's like saying "if blue is the sky" or "if tall is the man". A Duck: A feature added for no other reason than to draw management attention and be removed, thus avoiding unnecessary changes in other aspects of the product. Stringly Typed: A riff on strongly typed. Used to describe an implementation that needlessly relies on strings when programmer & refactor friendly options are available. Baklava code: Code with too many layers... While thin layers are fine for a pastry, thin software layers don’t add much value, especially when you have many such layers piled on each other. Each layer has to be pushed onto your mental stack as you dive into the code. Furthermore, the layers of phyllo dough are permeable, allowing the honey to soak through. But software abstractions are best when they don’t leak. When you pile layer on top of layer in software, the layers are bound to leak. Imagine you have uh, a toolbox. A set of tools. Looks okay, standard stuff in there. I always thought of PHP as Perl's brain-damaged little brother. In 2001, a chap by the name of Aaron Ardiri wrote a port of Lemmings to the PalmOS PDA platform. Now, he has given himself 36 hours to port it to two modern mobile platforms, the iPhone and Palm webOS, with OSX and Windows desktop ports for good measure. Ardiri posted his progress, and interim OSX binaries, to a liveblog here; it seems to be down, but there's a long, scroll-like screenshot of the whole thing here. It's quite interesting, in its descriptions of how coding practices have changed as platforms have become less cramped, and of the process of adapting 2001-vintage PalmOS code to larger (mostly UNIX-based) systems. Ardiri is considering adding another port to Android; I imagine this would involve some means of translating ancient, low-level C code into Java (or else a C compiler that produces Dalvik bytecode). If he's just dealing in C-based platforms, he could add Nokia's various platforms and (from what I hear) Samsung's new "Bada" OS, though whether there'd be much reason to bother is an open question. 1842 - Ada Lovelace writes the first program. She is hampered in her efforts by the minor inconvenience that she doesn't have any actual computers to run her code. Enterprise architects will later relearn her techniques in order to program in UML. 1987 - Larry Wall falls asleep and hits Larry Wall's forehead on the keyboard. Upon waking Larry Wall decides that the string of characters on Larry Wall's monitor isn't random but an example program in a programming language that God wants His prophet, Larry Wall, to design. Perl is born. 1995 - At a neighborhood Italian restaurant Rasmus Lerdorf realizes that his plate of spaghetti is an excellent model for understanding both the World Wide Web and that web applications should mimic their medium. On the back of his napkin he designs Programmable Hyperlinked Pasta (PHP). PHP documentation remains on that napkin to this day. Seen at Maker Faire: Two guys from ARM (the people who designed the CPU in your mobile phone and probably a dozen other devices you own) have designed an amazingly elegant new microcontroller prototyping board, for making electronic gadgets even more easily than with the Arduino. Called mbed, it consists of a board with a USB port and 40 pins. The pins do the usual things (analogue/digital I/O, USB, Ethernet, &c.), but that's not the impressive thing about it; the impressive part is the design of the whole system, which brings web-style agile development to microcontroller-based gadgets. When you get an mbed, you plug it into your computer (which may be a Windows PC, a Mac, a Linux box or anything else which can mount USB drives); it then appears as a USB disk, containing one file: a web link. 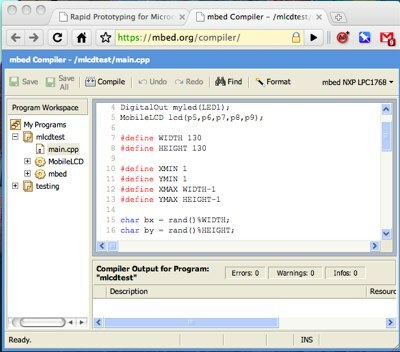 You go to the web link, which directs you to mbed's web site, where you log in or create an account; from then on, you have an integrated development environment in your browser, with source navigation, syntax highlighting and a compiler. Your code is hosted online on mbed's servers (the system uses the Subversion version control system as a store). Create a new project, and you get a "Hello World" program (written in C++) which, by default, flashes one of the mbed board's built-in LEDs. Hit the Compile button, and your browser soon prompts you to download a .bin file of the compiled program. Save it to the mbed card's drive, hit the reset button on it, and your program runs. This goes some way towards making building gadgets as easy as building web applications with a framework like Django or Ruby On Rails. mbed is somewhat more expensive than the Arduino (the price quoted was about £45 for the mbed board itself, whereas Arduino-compatible boards go for £13 or so). However, the elegance of the design, its ease of use and sheer niftiness could make it worth the price. Taking the concept of "minimal electronica" to a new level, a group of artists have created a collection of music tracks composed in only 140 characters of SuperCollider source code. You can listen to or download the tracks here. I wonder whether this will make enough waves to shake Apple into loosening their grip somewhat. Perhaps that'll take Jamie Zawinski to take up iPhone development, attempt to port DaliClock to it and then storm off in a huff. The core developers of Python (a rather elegant open-source programming language, in which, incidentally, this website is written) have broken ground on Python 3000, the massive, compatibility-breaking overhaul they intend to give Python, fixing the mistakes, shortcomings and inelegancies in the current version. Here are the things that will change, and here are the things that won't. And I don't buy the argument that anonymous functions are bad form, and that each chunk of code should have a name that describes what it does. There are many instances where one wants to specify a tiny fragment of code which will fit into a larger mechanism like a small but crucial cog (be it in a function call, a data structure or wherever), without the bureaucratic overhead of giving it a name. Otherwise we may as well be programming in Java or COBOL or some Vogon-designed abomination of a language. Fortunately, buffer-overflow attacks have a weakness: the intruder must know precisely what part of the computer's memory to target. In 1996, Forrest realised that these attacks could be foiled by scrambling the way a program uses a computer's memory. When you launch a program, the operating system normally allocates the same locations in a computer's random access memory (RAM) each time. Forrest wondered whether she could rewrite the operating system to force the program to use different memory locations that are picked randomly every time, thus flummoxing buffer-overflow attacks. Memory scrambling isn't the only way to add diversity to operating systems. Even more sophisticated techniques are in the works. Forrest has tried altering "instruction sets", commands that programs use to communicate with a computer's hardware, such as its processor chip or memory. This produces an elegant form of protection. If an attacker manages to insert malicious code into a running program, that code will also be decrypted by the translator when it is passed to the hardware. However, since the attacker's code is not encrypted in the first place, the decryption process turns it into digital gibberish so the computer hardware cannot understand it. Insha Allah, I am now trying to choose an editor for my software development and typesetting work. I have closely considered Emacs, which fits my needs in some respects. I do, however, feel that there is a big security issue with it for me and my brethren: Emacs was largely developed by Jews and for Jews. Considering how cunning the Jews are, I would not be surprised to find that they have hidden special bugs and booby traps inside emacs, in order to spy on and disrupt work of my Allah believing brethren. Are my concerns justified? We will spend more on hospitals! We will jail anyone not in jail already! We will spend billions limiting immigration! We will deport anyone we can deport! Nifty Python hack of the day: a C-style switch() construct, implemented without using dictionaries (instead using a class and yield). Glyph Lefkowitz is not only the developer/prime mover of an impressively elegant Python-based network programming framework, but has also written some nuanced and insightful essays about various topics, including a good argument for extending Python rather than embedding it (i.e., there are many good reasons other than laziness for it), a righteous excoriation of the Ayn Rand Institute's take on the "War on Terrorism", and a very astute attempt at a framework for ethics in software development, which does a good job of unmuddying the waters. Go and read. Why's Poignant Guide to Ruby, a gleefully insane and yet surprisingly useful beginner's guide to the Ruby language, peppered with zany examples and illustrated with cartoons, and sidebars rambling about gigantic robot monkey brains and such. A bit like those children's guides to TRS-80 BASIC programming and such that were around in the 1980s, only on much stronger drugs. Ruby's a fairly nifty language; though probably a bit too overshadowed by both Perl and Python, which are technically more ordinary-looking but good enough for most things and have inertia behind them, to become big. Still, I should probably get around to doing more with it at some stage. Dating Design Patterns, or, adapting object-oriented software design methodology to the task of picking up women (or, as the authors put it, "attempting to implement getLaid method successfully on FEMALE platform"); the "design patterns" have names like "Jini Singles Bar", "Pan-Dimensional Renaissance Differentiator" and "Reverse Polarity" (which sounds more like Star Trek than OOP). Classic Method Call: The recommended parameters for Just Asking. Structured Exposure, a.k.a. Container-Managed Dating: How to use commonly available dating containers to achieve maximum sessions with less time and effort and an array of services you don't have to write yourself. Python 2.3 is officially out, and brings with it lots of features. Generators are now a first-class part of the language (and not part of __future__), which allows a sort of lazy evaluation; Python can import modules from ZIP files; there is the enumerate() function, which allows you to iterate over a sequence's indices and values more efficiently, as well as Set and Boolean types; and there are a number of nifty new modules, such as a correct CSV handler, and more. Oh, and it's apparently 25% faster too. The latest development in Trustworthy Computing technology: NewCode, a programming language based on Orwellian principles. It is (theoretically) impossible to express security vulnerabilities in NewCode. The JRE is very large. Extensions do not support modularity. It is not backward-compatible across minor releases. Interestingly enough, the memo goes on to compare Java to Python, with Java coming out of it not looking very good. The Year in Scripting Languages, a roundup of what happened in 2002 in the worlds of Python, Perl, Ruby, Tcl and Lua. "Forget about Basic and go for Lua! Lua is just as easy to use, but a lot more powerful. Lua is also very easy to extend." -- Jon Kleiser, in comp.sys.mac.programmer.help. Python 2.2 now has iterators and generators, like some of the more outré functional languages (not to mention Ruby and SuperCollider). Here is a good tutorial. Linux geekery: A great big list of Linux sound hacking links. Everything from sound processing libraries to revolutionary new DSP APIs to file reading code to MIDI classes for Python and Tcl. Also, CDfs, which lets you mount a CD (including multiple sessions and audio tracks) as a special file system. MacOS X geek-out: Qt is now available for MacOS X. Mind you, there's no X11-style free licence. Meanwhile, Apple say they have ported Tk to MacOS X. Which means that Tkinter may soon be available to Python scripts running on OSX. Now hopefully someone will get around to writing a Gtk backend for Quartz (the MacOS X windowing/drawing mechanism). (There are already backends for Win32 and frame buffers, so it shouldn't be impossible.) Then it will be possible to run GIMP on MacOS X without an X server. I agree with ESR; Perl has its uses for quick file parsing jobs, but isn't really suited to large programming tasks (especially when there are better languages). Python is currently my favourite language for day-to-day use. I've looked at Ruby briefly, and it looks possibly more elegant than Python (some of the OO syntax reminds me of SuperCollider on the Mac), though isn't yet quite as mature as Python. A good opinion on why a Linux Visual Basic clone is a stupid idea. I agree; technically, VB's syntax has nothing to offer that Python (or even Perl) cannot trump by orders of magnitude, and VB compatibility would depend on having all the Windows guts there. The only reason I can think of for even considering such a daft enterprise is to have something on paper to impress clueless management types. This looks most interesting: Python WebWare; not as heavy as Zope, but it has some interesting-looking components such as Python Server Pages and WebKit. Is there a cool KDE application? Rewrite it from scratch with the GTK+ toolkit. Don't contribute enhancements to the existing project. Don't even evaluate their codebase for potentially reusable code; that goes against the spirit of COMPETITION. You need to write something... cooler. Is there a Java version yet? Rewrite it. What about a console version? Rewrite it. A applet? Rewrite. An EPPLET? REWRITE. A pure assembly version? RE. WRITE. ... Remember that rewriting is always a more creative process than porting, and there's nothing more important in mental health than a creative outlet. Doing a search on the appindex for "icq" will demonstrate how popular this method of project development/psychotherapy can be.